The National Weather Service says preliminary investigation shows an extremely rare tornado that touched down west of Seattle Tuesday was rated an EF2. That means it is considered to have been a significant tornado. Estimated peak winds during the tornado were up to 130 mph (209 kph). The Weather Service surveyed the damage and found homes without roofs, trees torn out of the ground and windows blown out of cars. It says significant tree and structure damage was noted along the twister’s path. Crews are inspecting hundreds of homes in a community west of Seattle where a rare tornado caused “a lot of chaos” but no serious injuries. The twister touched down Tuesday afternoon in Port Orchard, Washington. Local fire officials hoped to complete an initial damage assessment by Wednesday night. Kitsap County Search and Rescue workers along with search dogs worked into Tuesday night. They swept the area checking for people who may have been injured or stranded but found none. The storm severely damaged several homes and caused more than 1,000 to lose power. Authorities say as many as 450 homes may have suffered damage. A National Weather Service storm damage survey team is heading to a town west of Seattle where a strong tornado blew through a neighborhood. 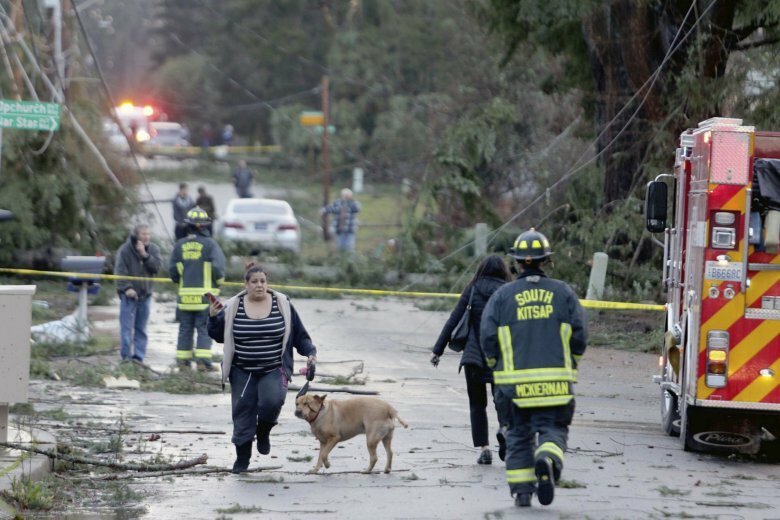 The rare twister touched down Tuesday in Port Orchard, Washington. It damaged several homes and toppled trees. The National Weather Service crew will determine just how powerful the storm was. The Kitsap County sheriff’s office told local media the damage was “catastrophic” and contained to neighborhoods east and south of a Walmart in Port Orchard. The sheriff’s office says power lines were down and roads were closed in the area. About 50 buildings were affected.